Next Monday marks the last meeting of the semester-long Creative Nonfiction Writing Seminar I’ve been teaching at Lasell College this fall. Today the class enjoyed a fantastic guest speaker: Jeanne Veillette Bowerman, who is the editor of ScriptMag.com, the moderator of Twitter’s weekly #scriptchat, and a general “writer of things.” The photo I took with my iPhone didn’t come out too well, but I’m posting it anyway to give you just a small taste of what it was like to have this dynamo in our classroom. I’ve actually known Jeanne since childhood; we grew up about five miles apart in a rural corner of upstate New York, near the border of Massachusetts and the Berkshires. We competed on the same high school gymnastics team, and I spent one of my teenage summers keeping the accounts at Jeanne’s mother’s antique auction business. A lot of years have passed since then, and after Jeanne returned to our hometown upon her graduation from Cornell, she’s accomplished more than you could imagine from that peaceful rural outpost. She ran a hotel and restaurant for a number of years, took some time off to become a mom, and then dove head-first into the career she really wanted — a career in writing. She developed several screenplays with a writing partner and got involved in the screenwriting community, and she somehow talked her way into the office of Douglas Blackmon, who was looking for a screenwriter to adapt his novel (now a Pulitzer Prize winner), Slavery By Another Name, into a screenplay. Fast forward a few years and Jeanne is the editor of ScriptMag.com; an in-demand panelist and speaker who has attended everything from pitchfests in L.A. to the Sundance Film Festival; a master networker; a #TwitterPimpAngel who helps connect writers, editors, screenwriters, and studios; and an all-around charming, go-getter of a human being. 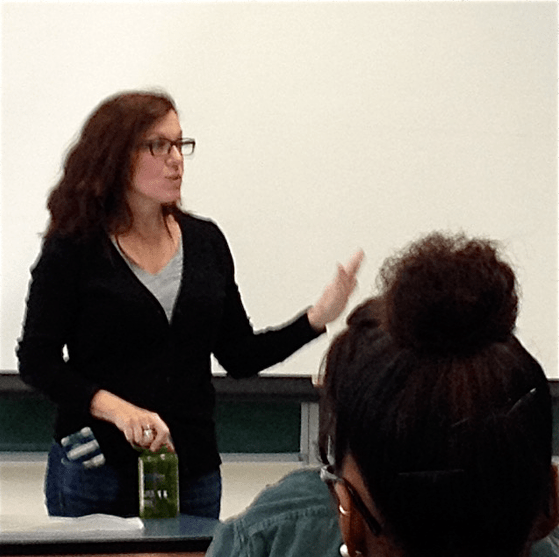 Jeanne tells her story much better than I do, but her insights into both the process and business of writing were invaluable to many of my students — and to me, as well. If I had half of talented Jeanne’s guts or chutzpah (check out her column: “Balls of Steel”) I’d probably be a lot further along in my own writing career. Many thanks to Jeanne Veillette Bowerman for wrapping up the semester with a fantastic presentation for my students today (all that’s left is next week’s in-class reading). You know, Jeanne, for two girls who grew up in the middle of nowhere and learned to do back handsprings on old wrestling mats, we haven’t done too badly, my friend.